In order to heat water using solar energy, a collector, often fastened to a roof or a wall facing the sun, heats working fluid that is either pumped (active system) or driven by natural convection (passive system) through it. The collector could be made of a simple glass-topped insulated box with a flat solar absorber made of sheet metal, attached to copper heat exchanger pipes and dark-colored, or a set of metal tubes surrounded by an evacuated (near vacuum) glass cylinder. In industrial cases a parabolic mirror can concentrate sunlight on the tube. Heat is stored in a hot water storage tank. The volume of this tank needs to be larger with solar heating systems in order to allow for bad weather[clarification needed], and because the optimum final temperature for the solar collector[clarification needed] is lower than a typical immersion or combustion heater. The heat transfer fluid (HTF) for the absorber may be the hot water from the tank, but more commonly (at least in active systems) is a separate loop of fluid containing anti-freeze and a corrosion inhibitor which delivers heat to the tank through a heat exchanger (commonly a coil of copper heat exchanger tubing within the tank). Another lower-maintenance concept is the ‘drain-back’: no anti-freeze is required; instead, all the piping is sloped to cause water to drain back to the tank. The tank is not pressurized and is open to atmospheric pressure. As soon as the pump shuts off, flow reverses and the pipes are empty before freezing could occur. 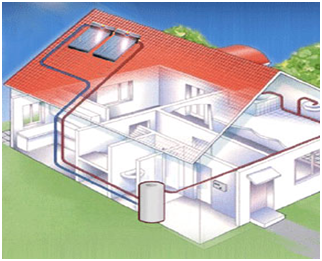 Residential solar thermal installations fall into two groups: passive (sometimes called “compact”) and active (sometimes called “pumped”) systems. Both typically include an auxiliary energy source (electric heating element or connection to a gas or fuel oil central heating system) which is activated when the water in the tank falls below a minimum temperature setting such as 55 °C. Hence, hot water is always available. The combination of solar water heating and using the back-up heat from a wood stove chimney to heat water can enable a hot water system to work all year round in cooler climates, without the supplemental heat requirement of a solar water heating system being met with fossil fuels or electricity.